Within the month, the State Board will issue orders requiring investigation of potential PFAS contamination, a widely used class of chemicals, at more than a thousand California facilities. Phase I targets airports and landfills. Phases II & III, to be implemented later this year, will include refineries, bulk terminals, fire training facilities, wildfire areas, manufacturers, wastewater plants, and domestic wells. PFAS are a class of chemicals widely used for decades in many consumer products for their grease- and stain-resistant properties, including nonstick products, carpeting, furniture, and makeup. PFAS were also commonly essential ingredients of firefighting foams used at airports and other locations where large quantities of flammable fuels were present. PFAS compounds are potentially toxic at extremely low levels. In the last several years, public scrutiny of PFAS has accelerated as their environmental prevalence has become better understood. Testing performed in connection with the U. S. Environmental Protection Agency's (USEPA’s) third “Unregulated Contaminant Monitoring Rule” (UCMR3) identified 133 PFAS detections in California drinking water systems, and follow-up testing resulted in nearly 300 more detections. In Phase I of its investigation plan, the State Board will issue orders to 31 airports it believes to have used PFAS-containing aqueous firefighting foam, and 252 landfills it believes to have accepted materials that contain PFAS. The State Board will also issue investigative orders to operators of 578 drinking water wells within a two-mile radius of one of the airports, and 353 drinking water wells within a one-mile radius of the landfills. It will also issue orders for 389 drinking water sources within a mile radius of PFAS impacts identified in the UCMR3 testing. State Board staff have already drafted the Phase I orders and expect to issue them by the end of this month, if not sooner. The State Board is still formulating the next phases, but staff said “high priority” targets in Phase II will be refineries, bulk terminals, and non-airport fire training areas. Phase II would also include manufacturers of PFAS, if any. (Presently, the Board does not believe there are any in California, but it intends to verify that understanding as part of the investigation.) In the second phase, the State Board will also test storm water in areas of the massive 2017 and 2018 California wildfires to evaluate whether burning of consumer products in those fires resulted in PFAS releases to the environment. Phase III will focus on so-called “secondary manufacturers” – those that use PFAS in their products or processes. Board staff specifically mentioned plating facilities as potential targets. The third phase will also include wastewater treatment and pre-treatment plants, and domestic wells. State Board staff expects to implement Phases II and III in the summer and fall of this year. If you get an order, you will need to be prepared to respond quickly. Targeted source facilities will receive an order issued by the State Board under the authority of California Water Code section 13267. These orders will require businesses to respond to a questionnaire regarding the historical use of PFAS-containing products within 30 days, and to submit work plans for conducting testing within 60 days. 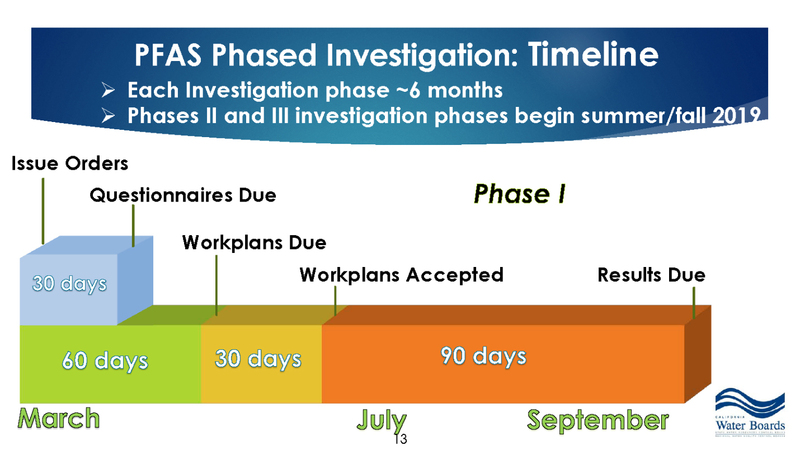 After the work plans are accepted, businesses will have 90 days to perform the testing and submit the results. Regulated entities should use great care in responding to these orders. Failure to comply may be punished by fines ranging from $5,000 to $25,000 per day per violation. Under the statute, the burden, including costs, of the ordered reporting must “bear a reasonable relationship to the need for the report and the benefits to be obtained from the reports” and responding parties may take steps to protect their trade secrets from public disclosure as a result of required reporting. Moreover, appropriate execution of the required testing is critical. Because PFAS are so widely used in consumer products, there are myriad opportunities for cross-contamination that could result in false positives if exacting sampling protocols are not utilized. Targeted water system operators will receive an order from DDW under California Health & Safety Code section 116400. Those orders will require periodic PFAS analyses, likely on a quarterly basis, unless DDW determines that a different schedule is reasonable. California’s Phased Investigation Plan comes on the heels of the February 14 release of the USEPA’s PFAS Action Plan, identifying short- and long-term actions USEPA plans to take over the coming years. USEPA said it will set federally enforceable Maximum Contaminant Levels (MCLs) for perfluorooctanoic acid (PFOA) and perfluorooctanesulfonic acid (PFOS) – two members of the PFAS family, designate those chemicals as hazardous substances under the Superfund law, require monitoring for additional PFAS in the next UCMR, and develop interim cleanup standards for PFAS in groundwater. The Action Plan would give the federal government greater enforcement authority over PFAS and has come under fire from a number of consumer advocacy and political organizations. The State Board, somewhat uncharacteristically, has not been on the forefront of PFAS regulation. In 2016, the USEPA published a Health Advisory Level of 70 parts per trillion (ppt) in drinking water for combined PFOA and PFOS. Then, in November 2017, New Jersey announced that it would be the first state to establish a legally enforceable MCL for PFOA, setting it at 14 ppt, the most stringent standard in the country. California has been more measured in its response. As Allen Matkins previously reported, in November 2017, the state added PFOA and PFOS to the Proposition 65 list of chemicals “known to the state” to cause reproductive toxicity, and in July of last year DDW set “notification levels” of 13 ppt for PFOS and 14 ppt for PFOA, and a "response level" of 70 ppt for combined PFOA and PFOS. Yet, to date, there is no enforceable drinking water or cleanup standard for PFAS in California, and Deputy Director Polhemus’ comments at the March 6 meeting made clear that none is imminent. The State Board and others are struggling with how best to address the whole class of thousands of PFAS chemicals without undertaking the massive regulatory effort required to set MCLs for each individual chemical in the family. Given this challenge, DDW has not requested a Public Health Goal (PHG) for any PFAS chemicals, and Deputy Director Polhemus said any such PHG is still at least a couple of years off, with potential MCLs at least a few years behind that. The release of DDW’s Phased Investigation Plan, however, is the first major step in California’s systematic approach to investigating the release of PFAS to the environment, and signals an imminent new regulatory regime. More information on the State Board’s March 6, 2019 meeting is available here. Kamran Javandel is an associate in the Environmental and Natural Resources and Litigation departments of our San Francisco office. His practice focuses on representing and advising clients in environmental and business litigation issues.